The Green Tara is one of the most common Buddhist savior goddess In Tibet, Mongolia and Nepal. Tara literally means "she who ferries across" or a "star." 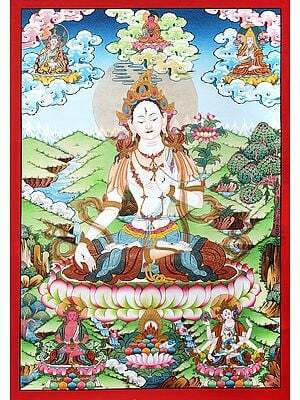 She is a Bodhisattva who manifests in the form of a female to represent compassion. In Tibet, her name is Sgrol-man ("Dolma") which means "she who saves." and her Mantra is the second after the Chenrezi mantra. They believe that She is a representation of the acts of compassion and that she is currently undertaking a process of stepping down from her throne and come down to help her sentient beings. It is further said that her love and compassion to the living beings is stronger than the love a mother has over her own children. Her main work is to bring longevity, give protection on the earthly travel and to guard all her followers through a spiritual journey towards their enlightenment. 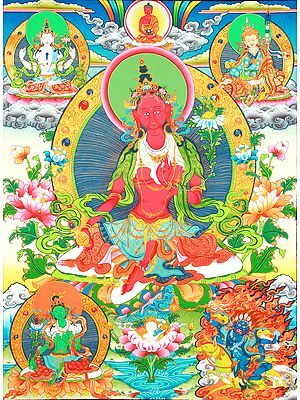 The Green Tara is an activity goddess who is full of youthful vigor and power. She is called Syamatara in Sanskrit and Sgrol-Ijang in Tibetan. She is a very fierce form of Tara but yet still very compassionate. Many consider her as the original form of Tara. The Avalokiteshvara even consider her as their consort. For the Buddha Amitabha, She is an emanation of the "self born." They also depict that the Tara`s head is an image of the Amitabha. She is believed to be to have come into existence as a result of the incarnation of the wife of Srong-brtsan-sgam-po who was a king of Tibetan. The color green is symbolic in Buddhism signifying activity full of accomplishment. Therefore the Lord of action, Amoghasiddhi is also associated with her because of the color green. In her iconography, her posture is depicted in such a way that it signifies her readiness and ease to take an action. Her right leg is left outstretched while her left leg is folded in a position that is contemplative. Her right hand is placed in a posture granting boon while her left hand is placed in a gesture or mudra of granting refuge according to the belief. 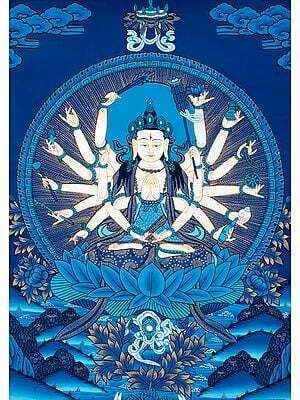 In her closed hands, she holds blue utpalas (lotuses) to signify power and purity and she is considered to be adorned with Bodhisattva jewels of richness. 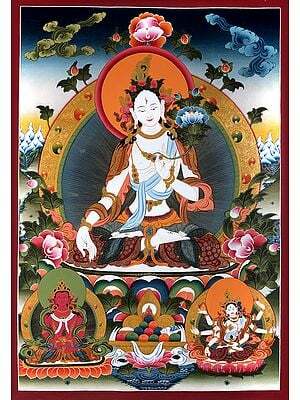 The primary role of the Green Tara in religious practices of the Buddhist is to be a savior. She is worshiped because of her great abilities in overcoming the most difficult situations and hard times. The Buddhists believe that she will help all her followers to overcome their fears, anxieties and dangers. They believe that her compassion is so much intense that she will take quick action to whoever calls upon her. "Goddess Tara, a female Buddha and meditational deity, is arguably the most popular goddess in the Buddhist pantheon. She is considered to be the goddess of universal compassion who represents virtuous and enlightened activity. The word Tara itself is derived from the root 'tri' (to cross), hence the implied meaning:' the one who enables living beings to cross the Ocean of Existence and Suffering'. Her compassion for living beings, her desire to save them from suffering, is said to be even stronger than a mother's love for her children." "Iconographic representations tend to show the dakini as a young, naked figure in a dancing posture, often holding a skull cup filled with menstrual blood or the elixir of life in one hand, and a curved knife in the other. She may wear a garland of human skulls, with a trident staff leaning against her shoulder. Her hair is usually wild and hanging down her back, and her face often wrathful in expression, as she dances on top of a corpse, which represents her complete mastery over ego and ignorance. Practitioners often claim to hear the clacking of her bone adornments as the dakinis indulge in their vigorous movement. Indeed these unrestrained damsels appear to revel in freedom of every kind."